Removable Customizable padded divider set that allow you to hold 2 DSLR and 2-5 lenses. Outer dimension: 18″ x 12″ x 8″. Compatible with Canon, Nikon, Sony, Fujifilm, Panasonic, Pentax, Samsung, Olympus and more SLR DSLR Cameras. Carry your SLR camera plus all your accessories and equipment with ease and comfort. Lightweight, comfort fit, backpack is ergonomically designed to maximize airflow and support. Backpack provides a large customizable main storage compartment and various pockets, offering convenience and portability for avid photographers on the go. 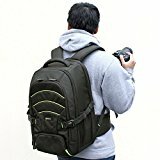 -Brand New Evecase larger Nylon Camera / Laptop Backpack with Waterproof Rain Cover. -Removable padded divider set, able to hold and protect 2 DSLR Camera, 2-5 lenses, arrange anyway you desire. -Zipper Laptop compartment(17″ x 10.5″) that hold up to 15.6-inch laptop, chromebook, tablet or books, which you can have access from upside. -Front zipper or interior mesh accessory pockets for pens, smartphone, memory cards, cables, chargers, lights & more. -Convenient side holder straps secure tripods or other bulky accessories, and the side pocket to hold water bottle..
-The heavily padded shoulder straps and wide, adjustable waist and chest straps make the backpack comfortable on the go. -Luggage handle slot securely attaches the camera bag to most rolling luggage. -Comes with a rain cover tarp to protect your gear under heavy rain or snow.